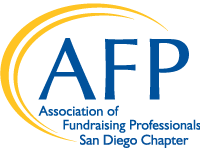 The San Diego Chapter is dedicated to providing up to date and best practice educational programs that will inspire you and assist you in your career. No matter where you are in your experience, our education committee has broken down some areas of interest for you. We encourage you to attend at least one of our educational events, whether it's a monthly luncheon and workshop, our audio conference or a SNAP! event. We want to provide you with an opportunity for learning and development. For more information you can click on one of the levels of experinces below or surf our site! We hope to see you at an upcoming event. Tags for AFP CA, San Diego Chapter community.